Adipocytokine, including leptin and adiponectin, may play an important role in the pathophysiology of osteoarthritis (OA). Spa therapy is one of the most commonly used non-pharmacological approaches for OA, but its mechanisms of action are not completely known. 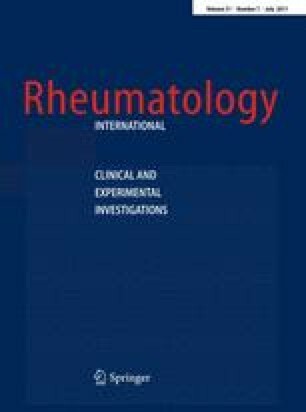 The aim of the present study was to assess whether spa therapy modified plasma levels of leptin and adiponectin in thirty patients with knee OA treated with a cycle of a combination of daily locally applied mud-packs and bicarbonate–sulphate mineral bath water. Leptin and adiponectin plasma levels were assessed at baseline and after 2 weeks, upon completion of the spa treatment period. The concentrations of leptin and adiponectin were measured by ELISA. At basal time, plasma leptin levels were significantly correlated with body mass index (BMI) and gender, but no significant correlation was found with patient age, duration of disease, radiographic severity of knee OA, VAS score or Lequesne index. There was no correlation between plasma adiponectin level and BMI, gender and age, duration of the disease, radiographic severity of knee OA and VAS score. A significant correlation of plasma adiponectin levels was found only with the Lequesne index. At the end of the mud-bath therapy cycle, serum leptin levels showed a slight but not significant increase, while a significant decrease (P < 0.05) in serum adiponectin levels was found. However, leptin and adiponectin concentrations after treatment were not correlated with other clinical parameters. In conclusion, our data show that spa therapy can modify plasma levels of the adipocytokines leptin and adiponectin, important mediators of cartilage metabolism. Whether this effect may play a potential role in OA needs further investigations.